Fighting to save her job, suspended Brazilian President Dilma Rousseff told senators on Monday that the allegations against her have no merit and that history would judge the country if she is removed from office. "I know I will be judged, but my conscience is clear. I did not commit a crime," Rousseff told senators at her impeachment trial. Rousseff reminded senators that she was re-elected in 2014 by more than 54 million voters. She said that at every moment she has followed the constitution and done what was best for the country. "I can't help but taste the bitterness of injustice" of this process, she said. In the middle of her second term, the left-leaning leader is accused of breaking fiscal rules to hide problems in the federal budget. Brazil's first female president denies wrongdoing and argues that her enemies are carrying out a "coup d'état." During her 30-minite speech, Rousseff argued that in early 2015 the opposition in Congress began creating a climate of instability by refusing to negotiate and throwing "fiscal bombs" in the face of declining revenues. She said the impeachment process had exacerbated the recession in Latin America's largest economy, flipping the blame on the opposition, which often argues she has to be removed for the financial climate to improve. Rousseff blasted interim President Michel Temer as a "usurper." Her vice president turned arch enemy will serve out Rousseff's term if she is removed. Temer took over when the Senate in May voted to impeach and suspend Rousseff for up to 180 days while a trial was prepared. Rousseff said that Brazilians would never have voted for a man who picked a Cabinet of all white men in a country that is more than 50 percent non-white. The Cabinet that Temer put in place in May has been roundly criticized for its lack of diversity. Three of his ministers were also forced to step down within a month of taking office because of corruption allegations. Rousseff said that process against her was launched by Eduardo Cunha, the former speaker of the lower house of Congress, who is facing numerous changes of corruption. Rousseff said he tried to "blackmail" her into providing votes from her Workers' Party to quash an ethics inquiry into him. Rousseff said it was "an irony of history" that she would be judged for crimes she did not commit, and by people who were accused of serious crimes. "I ask that you be just with an honest president," she said, her voice cracking with emotion toward the end of her address. The impeachment process began late last year, when opponents in Congress presented a measure to remove her from office. Her appearance comes a day or two before the Senate votes on whether to oust her from the presidency. Several hundred supporters demonstrated outside Congress, and cheered when she arrived. Outside Congress, a huge wall was put up to separate Rousseff supporters and pro-impeachment activists. Rousseff's appearance came on the fourth day of the trial which has seen name-calling, shouting and a declaration by the Senate President Renan Calheiros that "stupidity is limitless." Opponents claim her maneuvers were an attempt to continue high spending and mask deficits, which ultimately exacerbated a severe recession. The trial is being presided over by Supreme Court Chief Justice Ricardo Lewandowski. 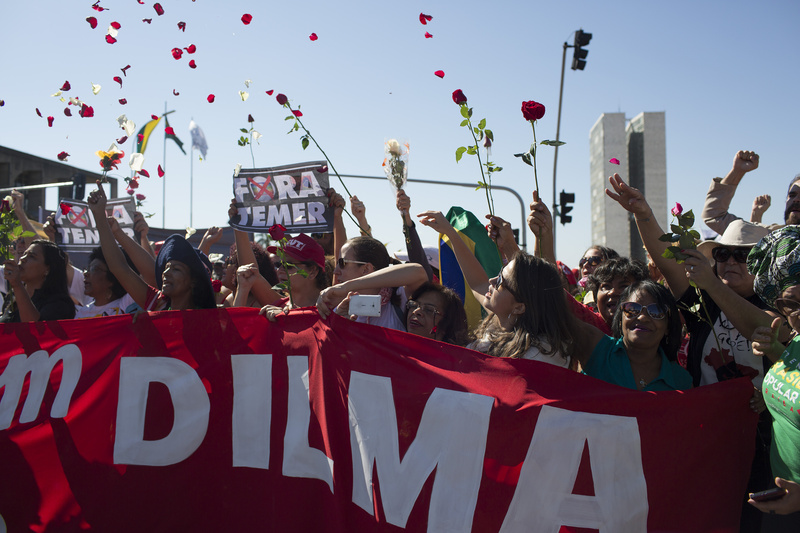 Before Rousseff spoke, he warned senators and spectators to remain silent.